Ideal for the adventurous, this 8-hour tour of Cueva del Viento and Masca allows you to explore a volcanic labyrinth and experience the beauty of two quaint towns. Alongside your expert guide, you’ll explore 17 miles (27 km) of darkened passageways in Cueva del Viento, hailed as the world’s largest lava tunnel way. This activity is not suitable for claustrophobic travelers. Then, admire the ancient dragon tree in Icod de los Vinos and admire the stunning scenery surrounding Masca village. Round-trip hotel transport is included. Please contact local supplier to arrange pick up if you are not staying in this area. Your tour begins with hotel pickup in the early morning. 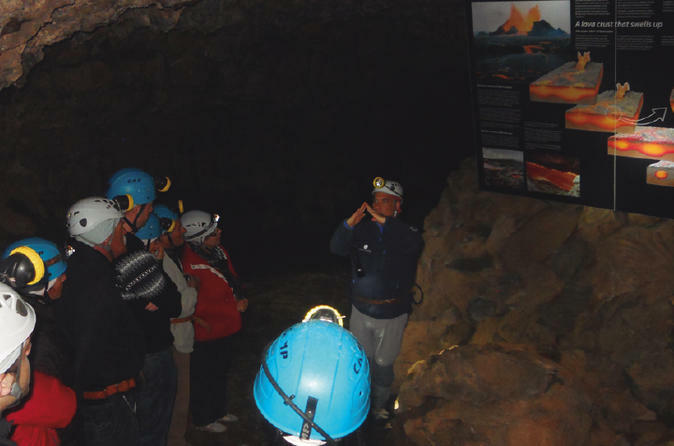 Board an air-conditioned minivan destined for Cueva del Viento, and prepare to descend to the volcanic labyrinth created by lava flows millions of years ago. While listening to geological explanations, follow your guide through narrow passage ways and darkened tunnels. From here, you’ll proceed to Icod de Los Vinos, home to what is reputedly the world’s oldest dragon tree. Admire the ancient plant and the sun-dappled plazas of the town before enjoying free time in which to purchase lunch. Sated, cool down in your air-conditioned vehicle as you pass Garachico, a town whose port was devastated by an 18th-century volcanic eruption. The quaint village of Masca has remained virtually unchanged for centuries: make your final stop here and admire its mountain perimeter and traditional architecture. Conclude your tour with drop-off at your hotel.